Although exotic aquatic weeds have been reported to be present in Africa since the end of the nineteenth century (Tackholm and Drar, 1950), they started infesting massively African freshwater bodies during the early 1950s (Mitchell et al., 1990) and rapidly spread in many countries. The growth of these weeds is extremely fast and this allows them to develop huge infestations in areas where they had not been reported only a few years earlier. These plants invaded lakes, ponds, rivers, canals and agricultural fields, becoming noxious weeds. The damage to the environment and the economy is enormous, having a disrupting impact on agriculture, fisheries, production of electricity, transportation, health, means of sustenance, living conditions and social structure. 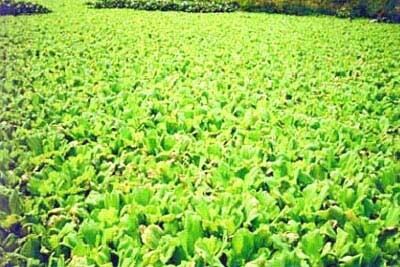 Water Hyacinth, Water Lettuce and Water Fern pose the most serious problems. Origin and Distribution. Water Hyacinth (Eichhornia crassipes (Martius) Solms-Laubach), which is native to the Amazon basin, Brazil (Penfound and Earle, 1948; DeLoach, 1976), became widespread throughout the world, also due to its attractive appearance. It is commercially available as an ornamental for ponds. Its spread started with its deliberate introduction into North America from Brazil, in the late nineteenth century, as an ornamental in ponds and subsequently escaped cultivation (DeLoach, 1976; Barrett and Forno, 1982). At present it occurs as a weed throughout tropical and subtropical regions of the world, including North and South America, Africa, Asia, Australia and New Zealand. Morphology and Biology. This perennial herbaceous plant is a floating freshwater hydrophyte. It belongs to the Family Pontederiaceae and all the species in the Genus Eichhornia are aquatic. 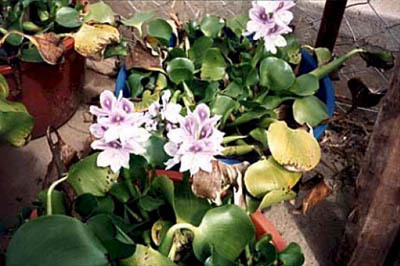 Water Hyacinth shows considerable variation in both leaf and flower form and colour, also depending on the age of the plant. The flowers are bluish purple, large and self-fertile. The seeds are produced in large numbers and are contained in capsules, each capsule containing up to 300 seeds (Manson and Manson, 1958). The seeds can remain viable for 5-20 years (Matthews et al., 1977). The plant can also reproduce vegetatively through the production of horizontal stolons. Weed problem. 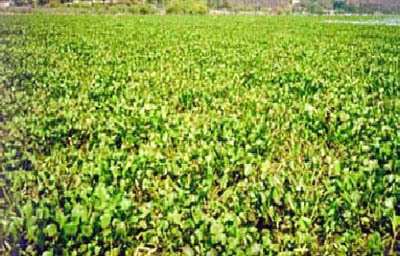 The fast growth of Water Hyacinth allowed the plant to build huge populations in its ranges of introduction, developing dense mats on the surface of the water and becoming a major weed problem. It is considered the worst aquatic weed in the world. The rapid increase and spread of the plant into new areas is due particularly to its vegetative reproduction, a single plant being able to develop very rapidly a significant infestation. Moving easily with water currents, winds or other accidental means, such as fishing nets and boats, the plant invaded rivers, canals, ponds, lakes, dams and other freshwater bodies. The main problems arising from the growth of Water Hyacinth in thick mats are (a) an enormous water loss through evapotranspiration, that alters the water balance of entire regions; (b) the impediment to water flow, that increases sedimentation, causing flooding and soil erosion; (c) the obstruction of navigation; (d) hampering fishing and dramatically reducing the catch and the source of food and income for local populations; (e) a drastic change in the physical and chemical properties of water and in the environment in the water bodies invaded, with detrimental effects on plants and animals; (f) the reduction of the activity of electrical power stations, jeopardizing the power supply of the country; and (g) a serious threaten to agricultural production, following the blockage of irrigation canals and drainage systems. The economy of the countries concerned was therefore seriously affected in many aspects. This weed represents an environmental problem as well and indirectly a public health problem, since it may create a microhabitat suitable for the breeding of many vectors of human diseases and for hosting poisonous snakes. Water Hyacinth is the principal aquatic weed in Africa. It is a weed problem in many countries, especially in Egypt and East, West and South Africa. This plant appeared in Lake Kyoga in Uganda in the early 1980s and it also occurs in Lake Kwania and down the Kyoga Nile. In 1988 it was observed in Lake Naivasha in Kenya. However, the most disturbing development in the region during the 1990s was in Lake Victoria. In 1990 dense mats of this weed were found interfering with fishing on the Tanzanian shore and during the same year mats were recorded on the Ugandan shore and around the Sese Islands. In Zimbabwe the plant attained the status of noxious weed in the 1980s. It was first recorded in Lake Kariba in 1994 and by 1996 it infested over 200 ha. In the early 1990s Water Hyacinth was also found in the Pangani River in Tanzania and the lower reaches of the Kagera River in Rwanda. FAO has been conducting numerous projects for the control of this weed (see Chapter 3). Origin and Distribution. The area of origin of Water Lettuce (Pistia stratiotes L.), is still speculative, being most probably South America (Cordo et al., 1981). The plant spread widely and at present occurs in all continents, except Europe and Antarctica. Probably the initial spread took place through ballast water in ships from South America. At present it is also commercially available as an ornamental for ponds. It is one of the most widely distributed water plants. In Africa it is ubiquist. Morphology and Biology. This perennial freshwater hydrophyte is a herbaceous floating plant belonging to the Family Araceae. It consists of a rosette of pale green leaves, prominently veined and it resembles a small lettuce plant. Water Lettuce has velvety-hairy, erect leaf blades, a very short stem and long feathery roots suspended in water. The flowers are bisexual. The plant reproduces and spreads rapidly by means of stolons and seeds. The seeds are easily carried by water for long distances, since they float during the first two days after they reach maturity. The hairy cover of leaves traps air and is water repellent, preventing the plant from being submerged by heavy rains. Both Water Lettuce and Water Hyacinth can bioaccumulate heavy metals (Sridahar, 1986). Weed problem. Water Lettuce is a major weed problem in the tropics, where its impact is similar to that of Water Hyacinth, both on the environment and on the economy of the countries concerned. However, it was not a weed problem in Africa until recently and its weed status appears to be due to the pollution of water bodies and the presence of organic wastes and residues of fertilisers. 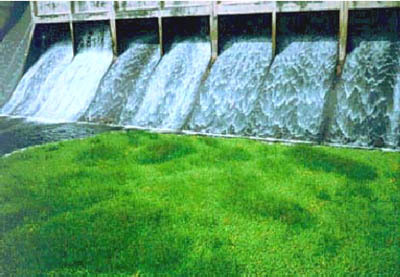 The plant develops dense mats and its noxious effects are similar to those caused by Water Hyacinth and include (a) causing an enormous water loss through evapotranspiration, with the consequent negative impact on the water balance in entire regions; (b) clogging rivers and canals and related problems; (c) interfering with the activity of hydroelectric power stations; (d) hampering fishing; (e) hampering navigation; (f) negatively affecting water control and use for agricultural purposes; (g) displacing of native species, because of the modification of environmental conditions: mainly due to oxygen depletion in water and sediments, increased sedimentation - caused by the roots - and excessive shading - caused by the leaves; and (h) indirectly affecting human health, since it provides a suitable breeding habitat for pests and vectors of diseases. Water Lettuce occupies habitats similar to those where Water Hyacinth occurs and is generally displaced by the latter, but, inversely, the control of Water Hyacinth may be followed by increased numbers of plants of Water Lettuce where mixed populations occur. 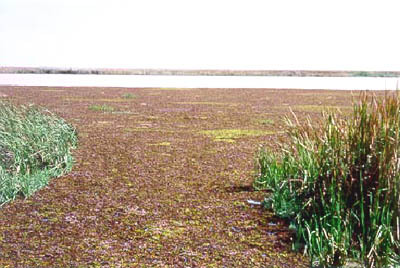 Water Lettuce invaded inland waters of various African countries in the early 1980s. The weed problem is particularly serious in West Africa, especially in Niger and Volta River basins, where FAO has been conducting numerous projects (see Chapter 3). Origin and Distribution. Also Water Fern (Salvinia molesta D.S. Mitchell) is native of South America, in coastal and inland regions of south-eastern Brazil. The plant was introduced to Sri Lanka in the 1930s and has rapidly spread since then, now occurring in tropical and subtropical regions worldwide (Holm et al., 1991). The species is commercially available for aquariums and ponds and this may likely have been the way it was initially introduced and may still contribute to its spread. In Africa it is a weed problem mainly in the inter-tropical zone. Morphology and Biology. Water Fern is a free-floating fern belonging to the Family Salviniaceae that lives in freshwater systems. Stagnant or slowly moving waters are the habitats most favourable to its growth. 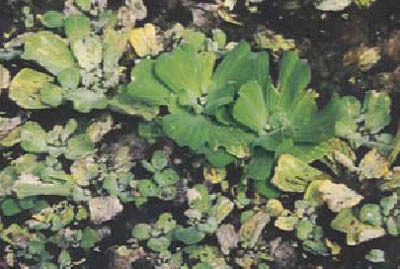 It consists of a horizontal rhizome that floats just below the water surface and produces at each node three leaves, two of which, aerial, are light green, broadly elliptic, about 25 mm long, while the third leaf, submerged, is brownish, filamentous, feathery and root-like and about25 cm long. The plant does not have roots. The submerged leaf, which serves as roots by absorbing water and nutrients, bears the sporocarp, oval in shape, which is the structure normally producing the spores. Hairs growing orderly, in parallel rows, on the aerial leaves assure a water-repellent layer that allows the plant to float (Holm et al., 1991). Individual plants are up to 30 cm long. Their growth is extremely fast, allowing the population to double within about one week (Mitchell and Tur, 1975). Mature plants press each other into tight chains, forming thick mats on the water surface and can withstand periods of stress, such as low temperatures, or periods of drought, regrowing from dormant buds. Water Fern readily reproduces vegetatively, by fragmentation of the rhizome, small fragments allowing the development of new infestations. The African plants are sterile and more vigorous than other accessions (Holm et al., 1991). Weed problem. Growing rapidly in dense mats, the plant invaded lakes and streams in its range of introduction, becoming a nuisance. Water Fern is also known as Kariba Weed, this common name originating from Lake Kariba on the Zambesi River in southern Africa, an area that was invaded by this weed. It has a heavy impact on the environment and the economy of the regions affected. It causes similar problems to those posed by Water Hyacinth and Water Lettuce, such as clogging canals, rivers and lakes; displacing native plants and animals; and interfering with the irrigation of many crops, navigation, fishing and the activity of electric power stations. In addition, it grows in rice paddies, where it poses serious problems. 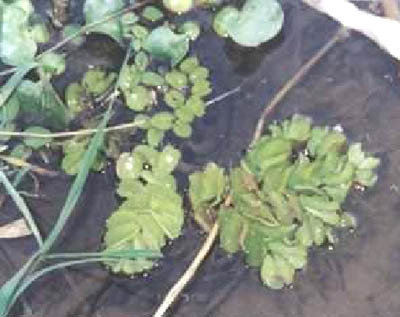 Water Fern invaded inland waters of various African countries in the early 1980s. The weed problem is particularly serious in West Africa, especially in Niger, Volta and Senegal River basins, where FAO has been conducting numerous projects (see Chapter 3).